You are relying on the calculations of the pastor in the faith that he did the calculations correctly. The place where the pastor messed up is that he assumed that the temperature gradient went all the way to the sun. The temperature gradient is how much the temperature changes the farther away you get from the EARTH. The reason we have seasons is because the earth is tilted and during the summer, the top half of the earth (The part in which we live) is tilted towards the sun so we get more light and therefore more heat. during the winter, it is tilted away, receiving less light resulting in less heat. Don't be silly. The reason we have seasons is because the LORD blesses us with them by His Will. [he made] the stars also. I am a strong christian and i believe that God and Science can co-exist. For example, sir Isaac Newton was a strong believer who contributed much to science. Nonsense. If you understood what the scientists actually say, you'll see they leave no room for Christ in any of their calculations. At the very best, they'll suggest God can exist in the "gaps," but they'll continue to decrease the gaps. First they did with physics, removing the Hand of God from the movement in the solar system, then they did with geography, removing the Hand of God from the age of the earth, they're doing it now with biology, removing the Hand of God from biodiversity. They're just hoping Christians don't take the time to really comprehend what it is they say, and it looks like you've fallen for their tricks. First of all, this is NOT a debate forum. We're right and you're wrong, according to Jesus and the Holy Word of God. Please read THIS thread before making an even bigger fool of yourself. Secondly, while the internets might seem to be "free" to you, this particular corner of the internets is a privately owned Christian forum. The rights you have on this forum are listed HERE. Please contact a Pastor immediately if you feel that any of your rights have been violated. Finally, your unsaved opinions or tantrums are not even slightly of interest to us. We follow the Holy Word of God TO THE LETTER, and make no apologies for that. One of the most important commandments in the Bible tells us to avoid unsaved scum such as yourself. You wandered in here uninvited, and unwelcome . If you want to debate people, THIS is the place to go. Please make a thread of your own in the "Introductions" section of the forum, so that we can properly greet you. Tell us about yourself, your church, and how you came to find Jesus. Don't be silly. Everything would roll off. Great work, Pastor. However, this is assuming that those formulas are correct. They were after all made by evil scientists who would believe that we were on the moon if I put it alongside with random numbers, so I would not put that number to heart. You are correct when you doubt the material produced by heathen scholars. They usually have an agenda to usurp Jesus and replace Him with His enemies. Thus, everything these scientists produce must be re-evaluated by the tools of Creation Science. The principal methods of Creation Science, prayer and Scripture are, however, extremely powerful and reliable ways to extract the Truth™. You can rest assured that all the material presented in LBC has been scrutinized by this method in order to present the sinners only conclusions that are beyond all reasonable doubt. Generally, we have found that atheist scholars do good maths and observations but their interpretation of results are of deplorable quality. Why is that? What a difference from us True Christian™ Creation Scientists! We know the Scripture. We know the Power of God to smite us any second, we know His habit of exterminating whole nations when they oppose Him, we are aware of his wish to slay His enemies before Him (Luke 19:27). That is why our results are of superior quality and you have no need to re-review them nor to repeat our experiments. God does the peer-review for us! I hope you haven't staked your life's claim on this pastor. Wien's displacement law states that the spectral radiance of black body radiation. Radiation is one of the many gifts we get from the sun. Ultra violet A, Ultra Violet B, Infrared light? Could you please address the topic in complete sentences? The most basic concepts of Creation Science dictate that all preliminary hypotheses must first and foremost be examined to assess if they are compatible with something that everybody knows to contain the Truth™, the Bible®. Now, let us look at the Bible regarding these issues. And God said, Let there be lights in the firmament of the heaven to divide the day from the night; and let them be for signs, and for seasons, and for days, and years: And let them be for lights in the firmament of the heaven to give light upon the earth: and it was so. And God made two great lights; the greater light to rule the day, and the lesser light to rule the night: he made the stars also. No triangles, no "Venus", no ultra-violent light... I am sorry, but this disproves your hypothesis. Still, I appreciate your efforts but next time it is prudent to test your basic assumptions against the FACTS first, it will make peer review less painful for you! The moon has to be the same miles away like the sun since they both have the same size. All this makes me wonder how much time Satan spends sending these trolls here with their "science" propaganda. The Bible explains everything know about the sun. The liberal science community is just a tool of Satan. I see what you mean, Dr Niles. Let's try and clear up the many, many questions this post poses! Wien's displacement law states that the spectral radiance of black body radiation. States that it does what? Ultra violet A, Ultra Violet B, Infrared light? What exactly is the question you are asking here? You can't expect Professor Dr White to clear up your misunderstandings if it is not clear what you want to know. He is a scientist, not a mind-reader. Which is only measurable when taking our distance to Venus and watching that over a years period. What does the word which refer back to? Which you will eventually find the farthest distance away creating a triangle and solving is easy. Again, what is which? And solving is a transitive verb; so, solving what? It implies a problem of some sort. If you tell us what it is, we can probably help you with that. The sun is much farther then you think. I am prepared to concede that you may be correct about this as I would have thought it was quite a lot closer than 491.1 miles. So yes, its distance from here is much greater than I thought before reading Pastor Billy-Reuben's explanation. After ten years no one has even come close to proving the Pastor wrong! Let me explain it more simply. If the sun was any further away we couldn't feel the heat from it. Actually , In space, radiation has nothing to dispurse itself into , and thus can travel millions of miles. Also, if the sun is so close, why isn't earth sucked into it's gravity? At that distance any orbital speed would cause an escape from it's pull, but would need to be hundreds or maybe Thousands of miles per second , so earth would likely just fall into the sun. The mass of the sun also accounts for how we can feel it's heat so far away. A fireplace will generate more heat than a candle. If you apply this to the SUN, it makes sense. The earth isn't flat. 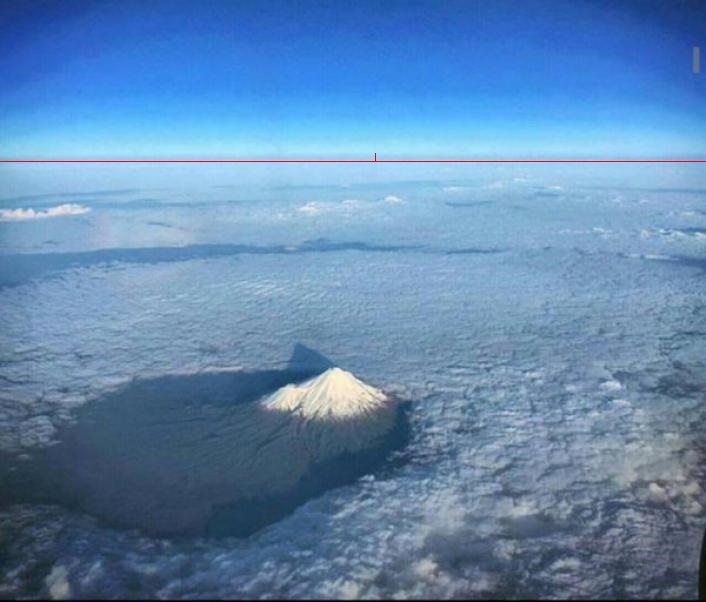 You can obviously see curviture of our planet as you climb higher. From amateur rockets, to the great Saturn V that brought men to the moon. Also, (i know this will come up) it was IMPOSSIBLE and would be MORE EXPENSIVE to fake a moon landing in 1960's/70's. Sorry for typos, i'm typing on an iphone! Nope. The sun is HUGE, but is much, MUCH farther from us than the Moon, while the moon is tiny and very close in astronomical terms. Mr. Van, you testimony above is apparently all the evidence that you are able to provide us. As such, it merits unbiased assessment that, however, is disastrous to your credibility. 1. Are you an eyewitness or just channeling secondhand information? If you are an eyewitness, your testimonial might have some merit (but see also 2 Thessalonians 2:11). Still, we would have to examine your reliability as an eyewitness. Have you ever lied? Have you ever interpreted evidence erroneously? If you have, then this could be one of those occasions,. We, in contrast, have an eyewitness account that is utterly reliable as it comes directly from God who is always Truthful™ (Titus 1:2). He is our eyewitness. 2. Your evidence leaks like a sieve of vanity (Isaiah 30:28). If the Sun were far away and huge, we would not be able to see how it shrinks as it circulates our disk. As you can see, closer to the horizon the Sun appears smaller, as it is farther away. This can only take place if the difference in distance is significant in percentage and that is only possible if the Sun is small and close. The image below will explain this to the uninitiated. In contrast to you, we have eyewitnesses who have indeed seen the horizon from high above, close to the Firmament (Genesis 1:6). It is not curved, as the photograph below proves without any doubt. As explained below, even if secular evidence did not prove the Sun's small size and location in the Earth's vicinity, the Bible would still take precedence, as the contradictory observations are obviously delusions, tests by God to determine which people are eligible to eternal Life in Heaven! I am always so amazed that common sense seems to elude so many people. There are indisputable facts, that even the simplest person can ascertain yet they hold fast to words in a book they read. Words put in such a manner that if questioned, they are often ridiculed as being a fool, so they steadfastly, stick to the story, no matter how obviously implausible. A month back, I was driving back from Vegas in the desert. 100 miles dead straight, flat and pitch black. I was driving along in my whaletail at about 130 listen to a CD of 'Jesus Hold me to your Bosom'. After a scant fifteen minutes, one of those hippy Prius came the other direction. I never saw the headlights of the queercar until it was five minutes away. Five minutes was less than 20 miles. If I could not see the bright headlights of a car in a pitch black night at 20 miles, how could anyone see the sun if it were millions of miles away?